Nao, a Japanese American girl, was born in California’s Silicon Valley, her father a successful ‘dot-com’ programmer. But as time passes, her dad and his projects become superfluous. In dire straits, the family has no choice but to move back to Japan. As Nao has never lived in Japan, her Japanese language skills aren’t so great. She’s a cultural outsider in many ways, and simply doesn’t fit in with her classmates. They take full advantage of this and bully her mercilessly. Some of the things they do are downright bizarre, but a quick check against factual documents lets the reader know that the weird things Nao’s classmates do are not unheard of in Japan. Nao tells us that she is a ‘time being’—someone who lives inside of time, as we all do. But, considering the horrors of her life and the fact that her own father has attempted suicide more than once, at sixteen, Nao has decided to ‘drop outside of time.’ That is, she plans to kill herself. Before Nao can commit suicide, she wants to write out the story of her awesome great-grandmother who is a Zen Buddhist nun and the mother of a World War II kamikaze pilot. Nao reflects on her great-grandmother’s life as it relates to Nao’s own life. And pretty quickly, she is telling her own story. Ruth—a main character in the book—lives with her husband on a remote island in the North Pacific, part of British Columbia, Canada. She’s a writer (so yeah, the author of the book is named Ruth, and there is this whole idea of transcending place and time). She is having a bad time with writer’s block and should really be finishing a memoir. One day in 2012, as she is out on the coast, she finds that a Hello Kitty lunchbox has washed ashore. Opening it, she finds, sealed in a plastic bag, some items including Nao’s journal. Seeing that this is from Japan, Ruth wonders if it was swept away in the tsunami of 2011. As she reads—and she only allows herself to read one entry per day—she worries. Was Nao’s family killed in the tsunami? Has Nao committed suicide? Is there anything she can do to help Nao? How would Ruth even locate her? How these two lives intersect is a beautiful story; at their point of intersection, they move into the realm of the supernatural. But here, this transcendence feels natural as the theme of being both inside and outside of time unfolds. For the time being, we are all time beings. But connected ones. High school housekeeping: This is a beautiful book, written for an adult audience at an adult reading level. For good teen readers, it is a gem—the endangered main character is a teenager, and so you will have an immediate connection to her. She thinks about some of the most serious things a teen must grapple with. If you are trying to work out deeper meaning in life, Nao’s relationship with her great-grandmother Jiko will touch and enlighten you. Her relationship to her chronically depressed father is also intriguing. For those of you who are already good readers, we want to offer books that are not just ‘harder’ to read, but that are examples of good or great writing. 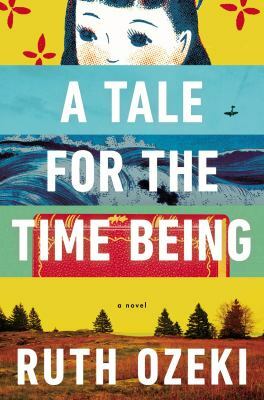 A Tale for the Time Being was shortlisted for the Booker Prize and the National Book Critics Circle Award. My dears, those are some big prizes. This novel is altogether satisfying. Enjoy, enjoy. This entry was posted in Faith-Based/Religious Element, Family Problems, Fiction, Human Rights Issues, Multicultural, Over 375 pages, Supernatural and tagged Adult books for teens, book reviews, British Columbia, bullying, high school, Japan, Japanese Americans, kamikaze pilots, literary fiction, suicide, teenage girls, writers, writing, writing life. Bookmark the permalink.